Home » Live Well » How To Gain Weight In A Healthy Way? While obesity retains its top spot on our concerns list, being excessively thin trails it by a narrow margin. Being too skinny is not only about how you look but also about your overall health.It can lead to low self-confidence, depression, dull skin, nutritional deficiencies and low energy levels. So, here is a plan that will help you put on some healthy weight. The calorie intake has to increase gradually and must come from natural food sources. Exercise routines have to be adopted to increase metabolism and maximum assimilation of nutrition. -Eat at regular intervals: 4 large meals with 2 fillers in between. 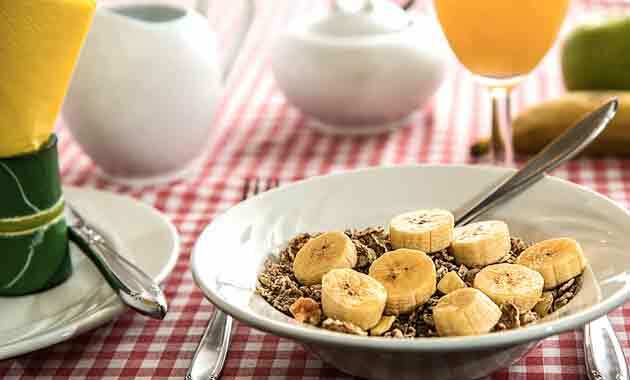 Start with a heavy breakfast within an hour of waking up; say at around 7:30, a fruit at 10, lunch at 12:30, nuts at 15:30, snacks again at 18:00 and dinner at 20:30. -Exercise regularly: A combination of Yoga, Cardio and Weight training. A day of cardio should be followed up with two days of weights and one session of yoga. Do not work out for more than 5 days every week. -Drink water: Staying hydrated is a key aspect of any health plan. Attempt to drink 4 liters of water every day. -Sleep well: 8 hours every day is the goal, an afternoon siesta for those who can afford will be even better. -Track your progress: Seeing the results is the biggest motivation. So make a weight chart and paste it on your bedroom wall so that you can measure the outcome daily. -Don’t quit: The trick is to go slow and steady, give yourself at least three weeks before you consider shifting to a different plan if your current one does not yield desired results. -Stay happy: Being at peace with yourself is the greatest bliss and the most essential ingredient of any plan. Socialize more (in reality), read more books, eat out more often and talk to friends and family. Meditate every day to kill stress and anxiety. This tropical food is our favorite when it comes to healthy carbohydrates. The potassium content of bananas gives an instant energy boost. We recommend eating one ripe banana every morning or before a workout. The king of fruits is nutrition packed with carbohydrates besides nutrients like dietary fiber, vitamins and essential minerals. Substituting processed sugar laden desserts with a cup of mango cubes after dinner will help one gain weight. Healthy fats, carbohydrates, essential minerals and fibres are all that you gain by munching on a handful of mixed nuts and raisins as snacks. One egg each day is the way to go. These are rich in carbohydrates, minerals, proteins and Vitamins. Boil it, fry it, poach it or even scrambling is good. Have it with any meal, preferably breakfast. The original energy drink is an essential component of our weight gaining lesson. Include a glassful with breakfast or dinner. To add variety, prepare shakes with mangoes or bananas or any fruit for that matter. The world is talking about the goodness of this misunderstood super food. Ghee is fat heavy and has medicinal properties like being anti-inflammatory and anti-oxidant rich. Pour in a spoonful in pulses and enjoy with your lunch. Whole grain products like whole wheat, brown rice, brown bread and oats are wonderful sources of healthy carbs and dietary fibre. Have these for dinner every day. Even whole-wheat pasta is an option you must consider. Well, the best sources of proteins are also rich in fats of the good kind besides containing a host of other nutrients. Include 150-200 grams of these in your lunch as well as the dinner every day. So, if you are planning to put on some weight, try these simple to follow ways along with routine exercises.Make sure you drink plenty of water and sleep on time so that your body transforms in a healthy way. Stay Healthy, Stay Happy! ← Protein Supplements: Do You Really Need Them?